In addition to wonton, I love gyozas, pot stickers, dumplings and 小籠包 (xiao3 long2 bao1), which literally translated means “little bamboo steamer bun”. The second character 籠 (long2) which means “bamboo steamer” is comprised of the bamboo radical 竹 (zhu2) at its top and beneath it, 龍 (long2) which means “dragon”. Both 籠 and 龍 have the same pronunciation and tone. 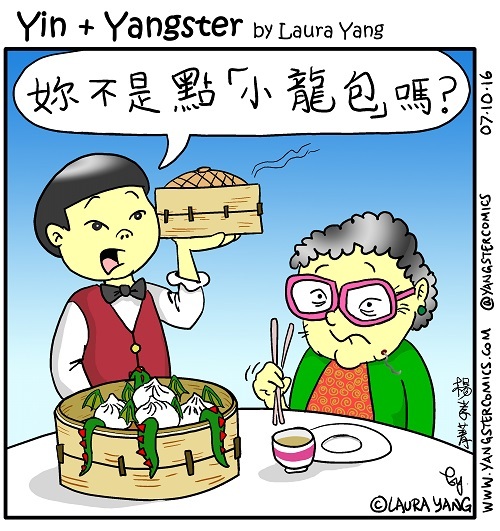 Naturally it wasn’t much of a stretch to change “little bamboo steamer bun” into “little dragon bun”, or 小龍包. Ahh, I just love deconstructing the Chinese language… or is this considered butchering it?